Effective infection control in the healthcare sector is vital to public health. Therefore methods to continually monitor and treat contamination are a major concern of governments around the globe. This unique book will bring an understanding of decontamination to a wider audience interested in public health, including healthcare specialists, scientists or patients. The first set of chapters provides readers with an introduction to decontamination in the international healthcare sector. 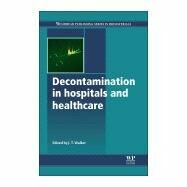 A second set of chapters look at decontamination practises in hospitals and healthcare settings. The third group of chapters discuss decontamination of surgical equipment and endoscopes.